SLOW-CURE™ 30 min. Epoxy is an equal two-part hobby adhesive that forms high strength bonds through a chemical reaction between the resin and hardener. The cured epoxy is resistant to most chemicals. SLOW-CURE™ has the highest strength of our epoxies and should be applied in temperatures above 70°F. 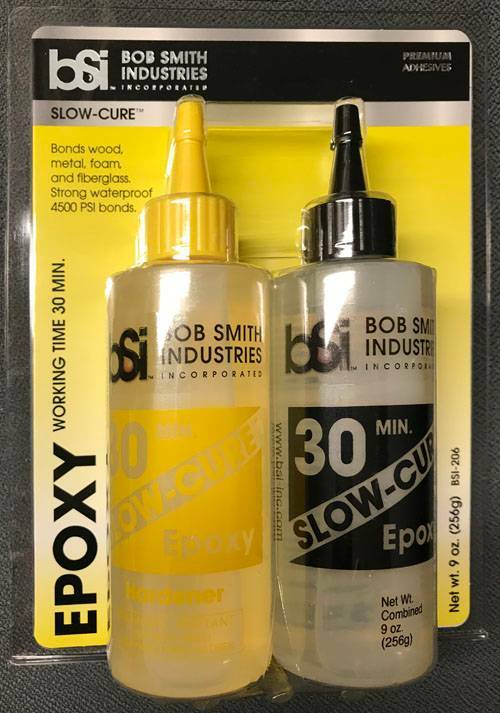 SLOW-CURE™ maintains it’s strength in both the lowest and highest temperature ranges of our line of epoxies. SLOW-CURE™ bonds best to clean, textured surfaces. Smooth, non-porous surfaces should be roughened with coarse sandpaper to improve adhesion. Acetone and Isopropyl rubbing alcohol work as the best solvents for cleaning uncured epoxy from surfaces. SLOW-CURE™ works best for forming reinforcing fillets on joints and can be mixed with microballons or other fillers to form putty-like consistency. SLOW-CURE™ is waterproof and forms superior bonds if you’re willing to wait overnight. It has better penetration of porous surfaces for better bonding. Full cure in 6-8 hours.